CORPUS CHRISTI (Kiii News) -Fire investigators are continuing to look for the source of a booming noise on the Southside of Corpus Christi that is leaving residents with more questions than answers. A number of viewers called our newsroom Sunday with reports of a loud explosion in the area around Yorktown and Rodd Field. Emergency crews rushed to the area Sunday night around 6:30 PM concentrating their search efforts in the Rancho Vista subdivision. "All of a sudden you heard a boom and it shook the house and I immediately went back to the back door open that up because I thought the explosion was back there. Went up to the deck, nothing to be seen. Came out here, the neighborhood was out here as well searching to find out what was going on," said Mary Jane Garza. "We felt and heard the same thing that everybody else has been telling you. One loud boom. We came out. Everybody within seconds was out coming out of their house trying to figure out what else was going on," said Victor Lopez. 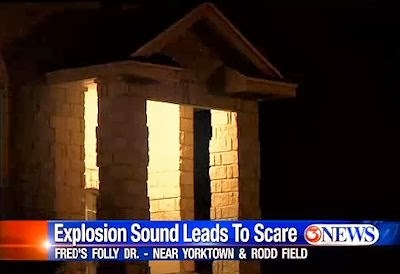 The Corpus Christi Fire Department tells 3News they did not find a cause for the booming sound . . ..